Irish Dexters for sale! and how about some poultry? I’ve updated my dexter page with information on the animals currently available for purchase. Right now we have the following available: Cranberry (4 year old) , Junie B. (coming yearling), Ivy (heavy bred coming 2 year old) and Zelda (coming yearling). We’re in WNY between Jamestown and Fredonia. 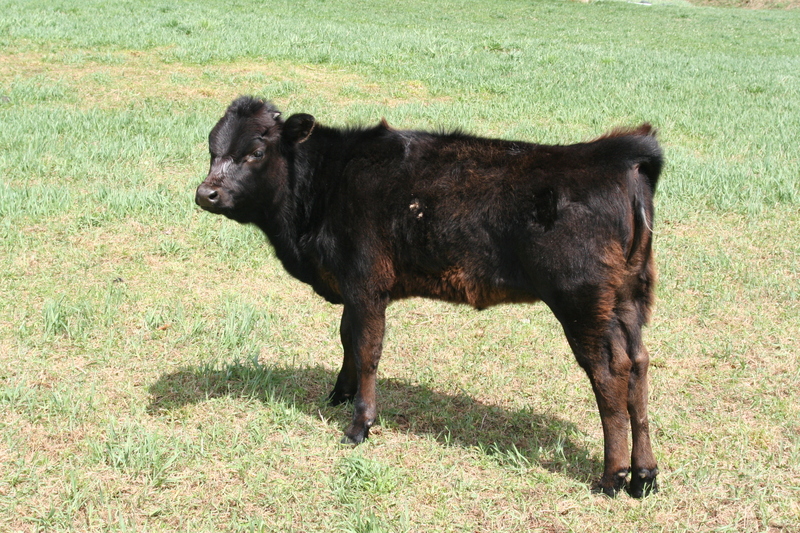 See my Irish dexter cattle page for more information. Also starting a search of my own for Dominique chicks and (if I can convince John) Midget White Turkeys. Do you know anyone in the WNY/NWPA area who has either one? I’m changing up what chickens I’m trying to raise. If anyone is interested in working with the White Chanteclers I have, I’d be happy to pass them along. They are starting to get some age on them (several are my original chicks from April 2011). I’m not positive if some of them are full Chantecler (the younger ones). I’ve got 4 original hens plus an offspring rooster and 3 offspring hens. I’ve also got a Chantecler/bantam ameraucana cross hen. I’m moving on to a different breed in hopes of meeting our needs a little better- more geared to eggs, better camouflage for free ranging, better able to reproduce themselves. I’ve had poor results in raising chicks, both in surviving eggs (broody or incubator) and in not loosing partly grown chicks to predatory birds. Everything I didn’t intend to keep, on the other hand, has done better for me. In some ways I hate to give up on them, but in other ways, I’m okay with moving on. An eventful week for our critters! Since the calf was born, I’ve been milking. LOTS of milk! Not as much as a “real” milk cow, of course, but plenty for us. 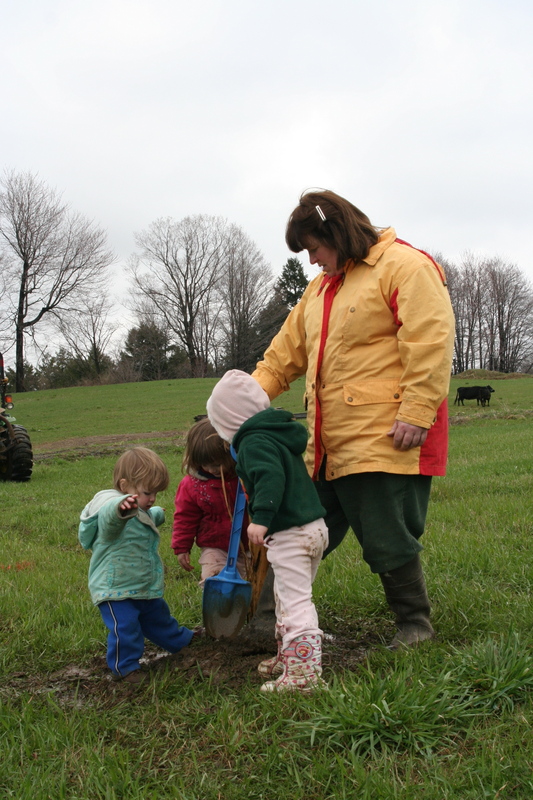 I’ve been getting about 3 quarts a milking over the last several days. I’m milking twice a day until the calf can take it all, then I’ll drop back to once a day and pull the calf for 12 hours or so. Norma has been a wonderful milker for me. 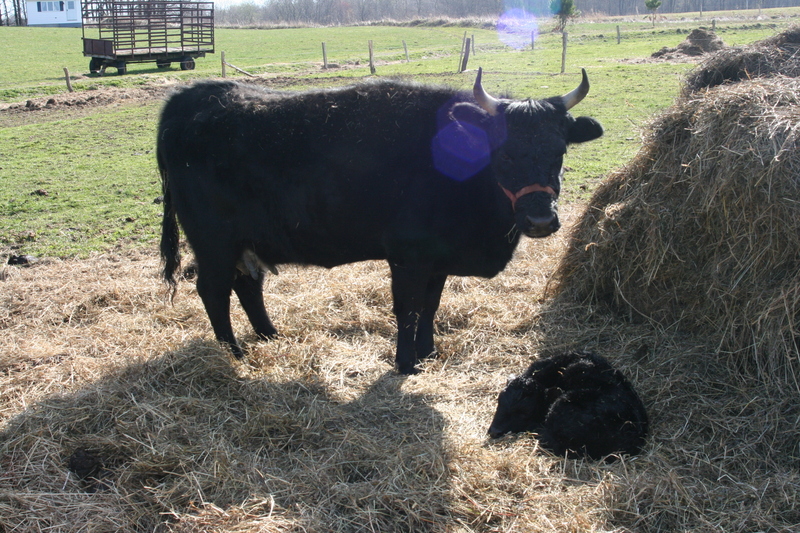 The only time I had trouble was when she left her calf in the hay pile instead of getting her to come out for milking time. We won’t do that again- for Norma’s sake and for mine. 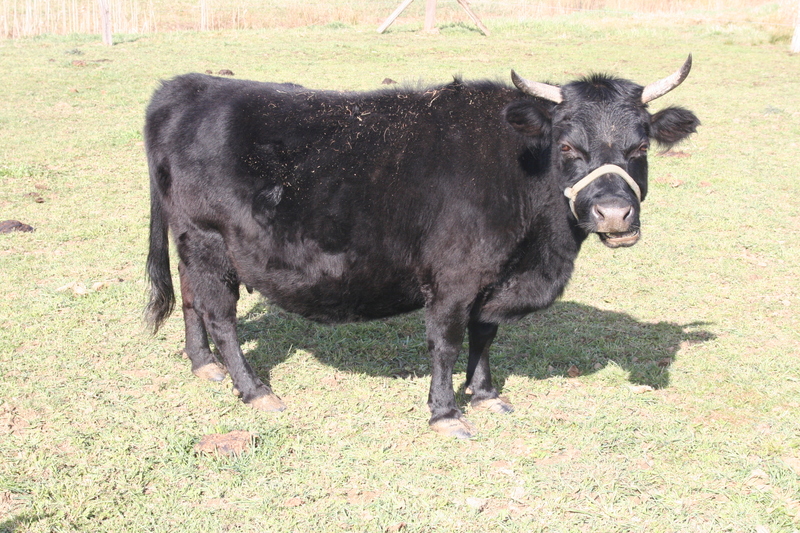 She’s a nicer/better milker than Ellie, AND her milk tastes a lot better to me- not cow-y. I’m so glad! I’m hoping that won’t change with the spring grass. Lots of milk means new recipes to try. I tried some beesting new cheese- it was okay, but hard to know how to eat it exactly. I roughly followed the directions here. Basically, you pour the colostrum in a pan and add a bit of sugar. Bake ’til it starts to brown. You can “test” your colostrum (aka beesting) by cooking a bit in a frypan to see if it sets up- kind of like scrambled eggs. Recipes use it in place of eggs for pudding and the like since it firms up so much. Next I made some fresh butter. Mmmm… Mom let me borrow her old Daisy (I think it is one of those) churns. They had built a board for it when we were kids so you could sit on the board and the churn would hold still while you cranked. My girls got to try it this time, and had fun- for a few minutes. Then we finished it. 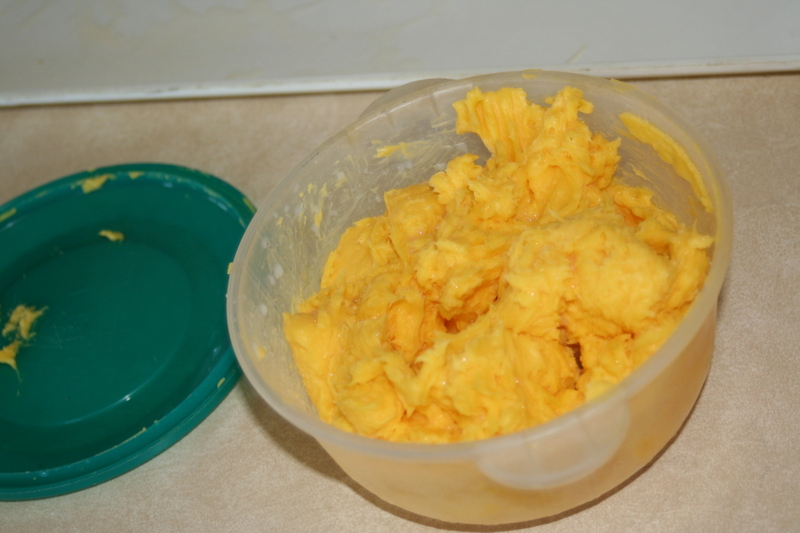 Very yellow- a lot of the cream was early cream, so the colostrum content made it richer colored. Some of the leftover buttermilk got used in buttermilk pancakes for dinner last night; recipe from Betty Crocker. 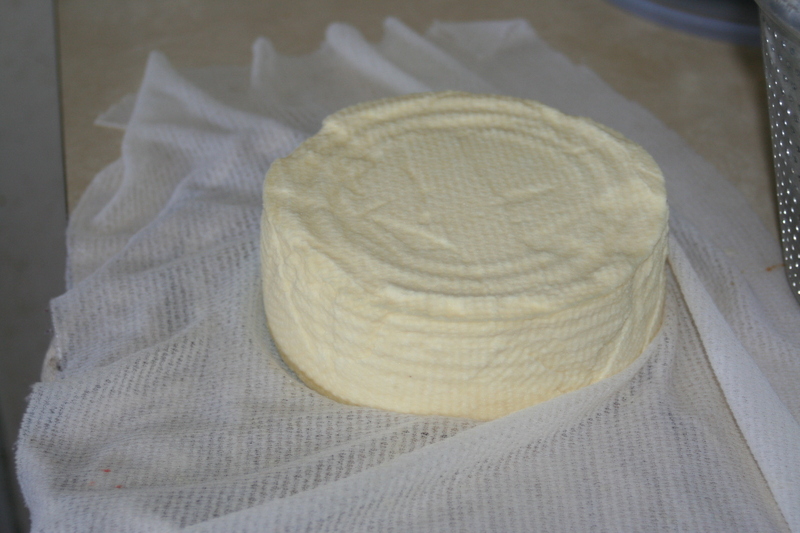 Today was a cheese making day. I am trying “Lannie’s Easy Cheddar” from the “Keeping a Family Cow” board. I’ve used it before, and it’s a foolproof recipe as far as getting a product that acts properly with no fuss. It’s a good cheese to start out on. It’s flexible as far as temperatures and times go, and it “cooks” in the sink (or in a bigger pot of hot water), so there’s no worry about scorching it. The only problem is we haven’t been a big fan of the clabber to start it. The flavor isn’t what we’d like that way. This time I used powdered mesophilic starter and skipped the yogurt to see what our end flavor will be like. We’ve made cheese curds before with a similar method and enjoyed those. The cheese curd recipe is over here– I “cooked” these in the sink, too. I’ve also found that rennet doesn’t work for me ’til more like 85*, but maybe my thermometers are off. I say that so that if you’re not getting a curd to set, try raising the temperature a bit. Mine is now in the press (my ever-so-sophisticated #10 can, apple pie filling, and books for weights) and will stay there ’til tomorrow. With the whey I’m trying some mysost. I’ve never had any, so we’ll see what it tastes like! I based my attempt on the post here. You cook down the whey, optionally add cream (I didn’t) and whip it up when the extra liquid is cooked out. It’s supposed to take 4-12 hours. I did about half of the whey left from my 2 gallon batch of cheese in the electric fry pan. It was done in less than 3 hours. 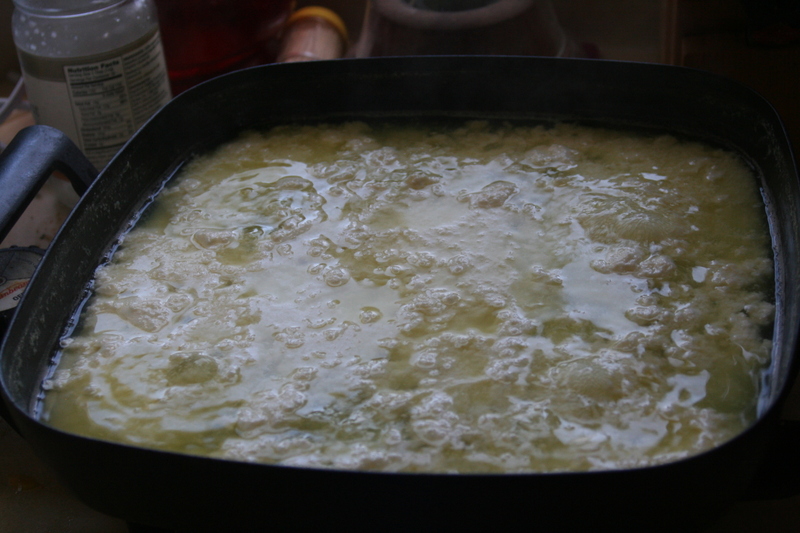 It looks a lot like ricotta as it cooks down, but instead of straining, you just cook off all the extra liquid. 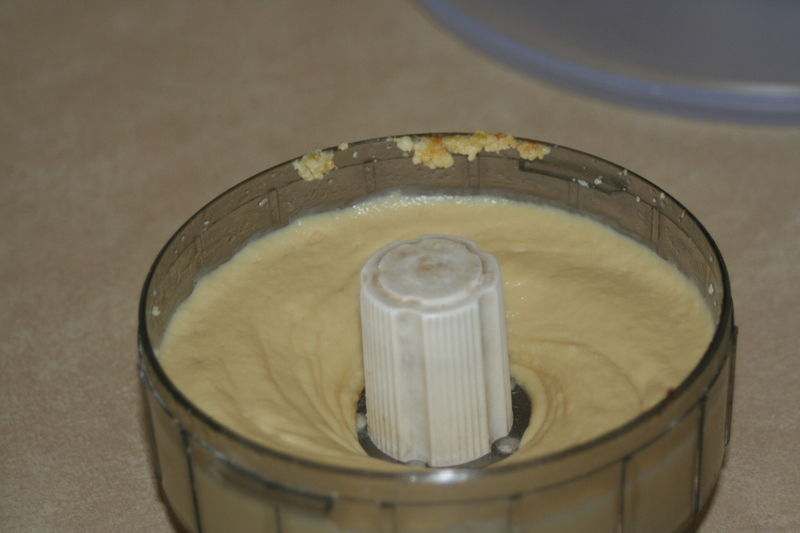 Since it was curd-y I put it through my mini food chopper to smooth it out. It’s a different taste- good, but I’m not sure how to use it. A sweet, tangy, creamy, rich, caramelized flavor. Anyone have suggestions? I tried it on a saltine, but the cracker was a competing flavor. 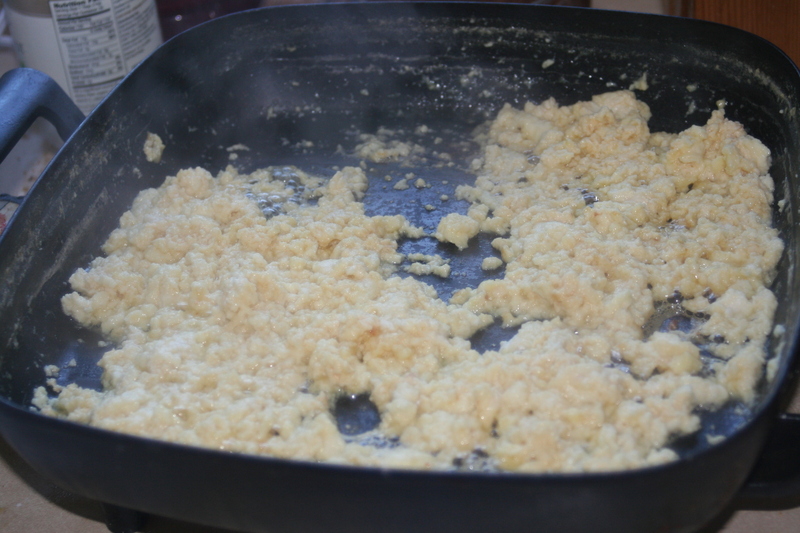 Added: Here’s what it looked like when it was done cooking, before I processed it. 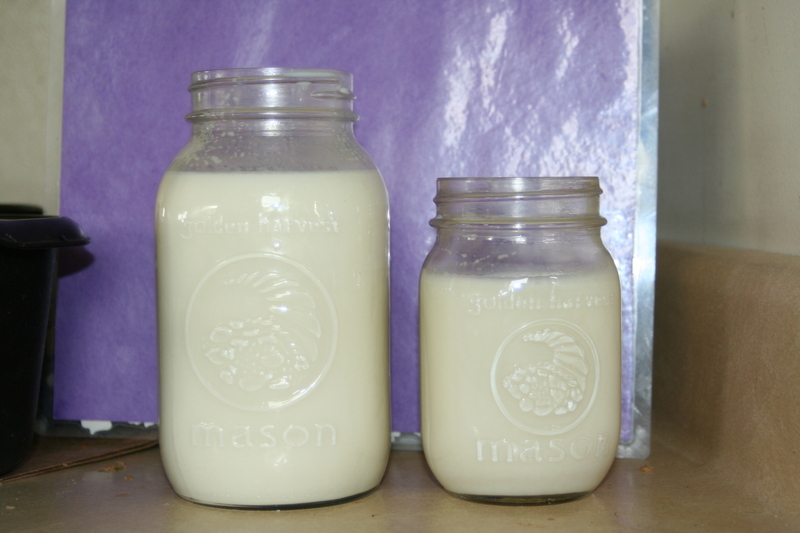 My kefir grains were put in the mail today from a gracious woman on the “keeping a family cow” board who was willing to share. I’m looking forward to them! I’ve got a collection going of different things I’d like to try. Enough about milk. 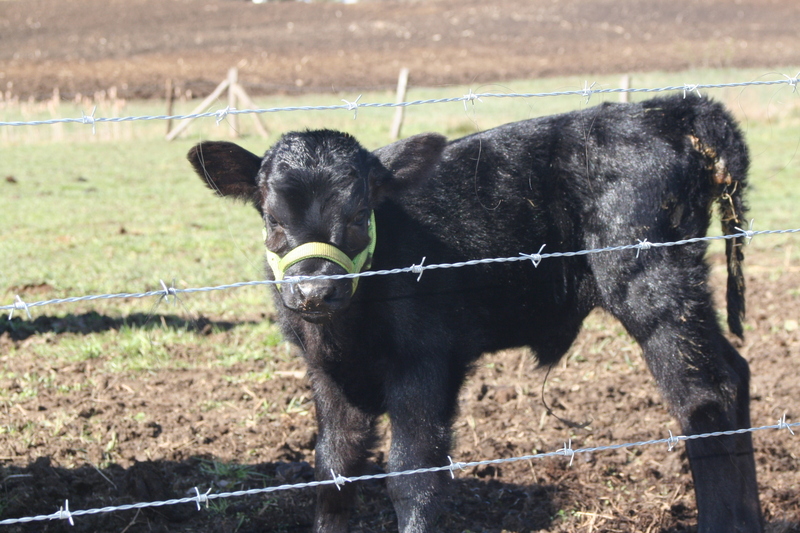 We named the calf. She is Nightingale. The girls were sure she should be “gai-gai”, Her mama’s name is Norma, and her daddy is Gideon, so NightinGale it is, gai-gai or gail for short. I weighed her on Monday and she was 47 lbs. She’s getting to be a bit of a pest, too! She gets out of the fence and I’m having a terrible time catching her now that she’s getting to be so quick! 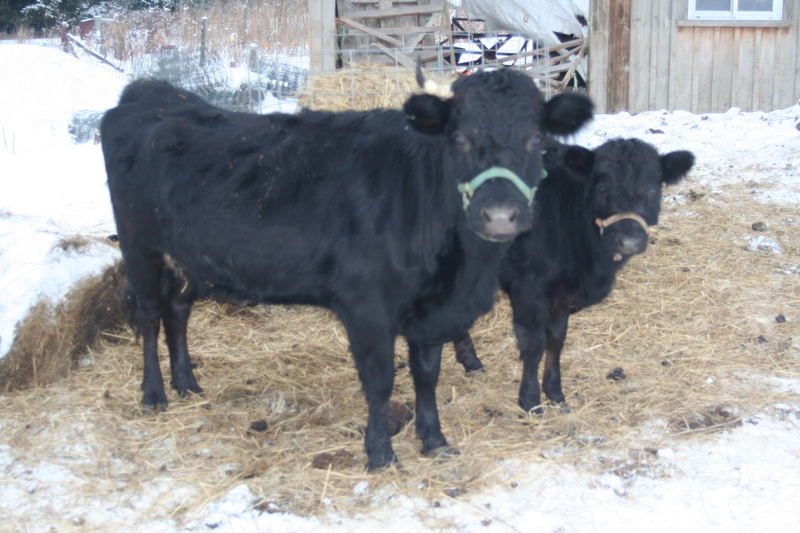 I’ve been milking Ellie for almost a month now, just in the mornings, and letting her calf (Cranberry) have the rest. 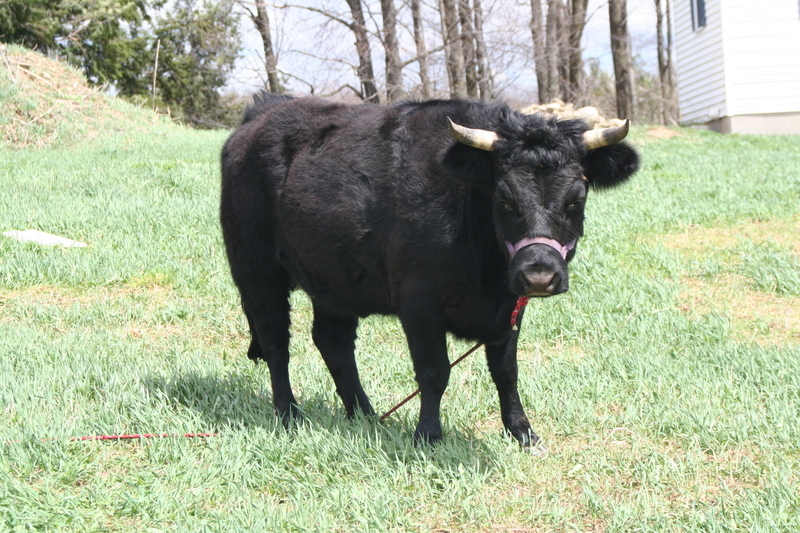 Ellie is a gentle girl, and I milk her in the field tethered with about 8-10 feet of rope. She’s never kicked at me. I give her a bit of grain and start in milking. She moves around some once her grain is gone, but stands reasonably well for me. I separate Cranberry and let her nurse in the morning when I’m done and in the evening she gets everything. My first day I got a cup. The next (almost) two weeks I only could get a pint. After some helpful advice from some people who’ve “been there,” I’ve been getting about a quart for the last week. Ellie, for all her good traits, is also a good mama and doesn’t want me to get much of the milk that should be her for her baby. So she “holds up” on me. I work my little hands as hard as I can to get a bit of milk (the 2 cups). 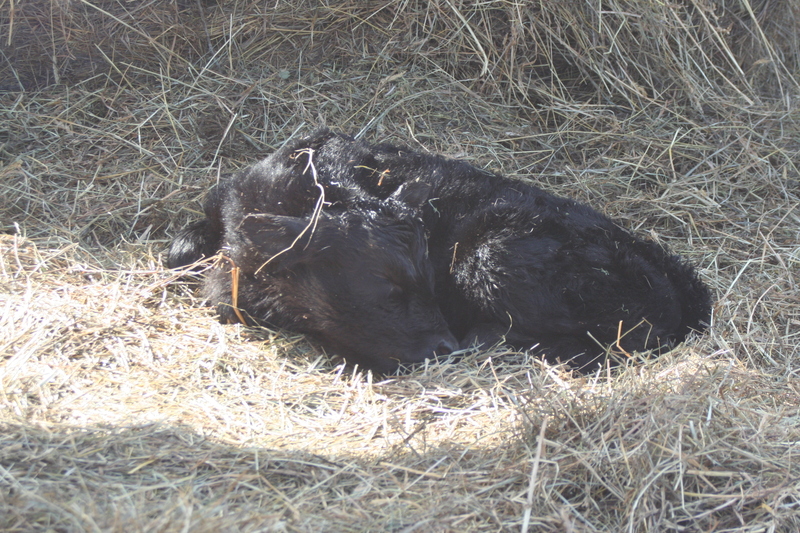 I knew she was capable of “holding up” because there were times I could barely get a drop working as hard as I could, and she had not had access to her calf for over 12 hours. I was informed, though, that she was probably STILL holding up, even though I was getting some milk. The suggestion was to let the calf “start” her for me for a few minutes so she would “let down”. 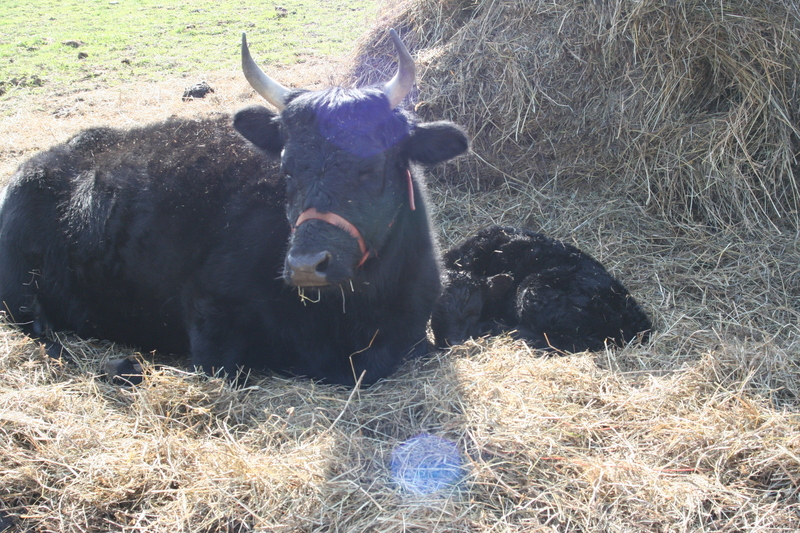 Then wash her up and milk until it was too difficult again, let the calf on again, and repeat. Lo and behold, It was 100 times easier to milk her after Cranberry got her “started” for me! So since then I’ve been working to get my hands/wrists/arms to cooperate so I can milk more. I broke the “quart barrier” a couple of days ago (Just a bit too much to fit in a quart jar when I put it away). I haven’t made it for the last 2 days, but this morning I hit a new record. I’m now up to almost a quart and a pint! Woohoo! If I’d get at it and freeze a bunch of ice, we could make some fresh milk ice cream to celebrate! My hands/arms are getting a bit longer lived now, despite my bad wrists. I’m a little more productive when I milk thanks to the easier milking from letting the calf start and the rest time while the calf nurses. I tried a new strategy this morning that helped me get that extra (almost) pint. I only gave her a bit of grain to start with, and held some back so that each of the 3 times I had my “turn”, she had some grain to eat again and would stand better for me. Maybe I’ll finally get a makeshift stanchion made soon so that she can’t move around as much on me. 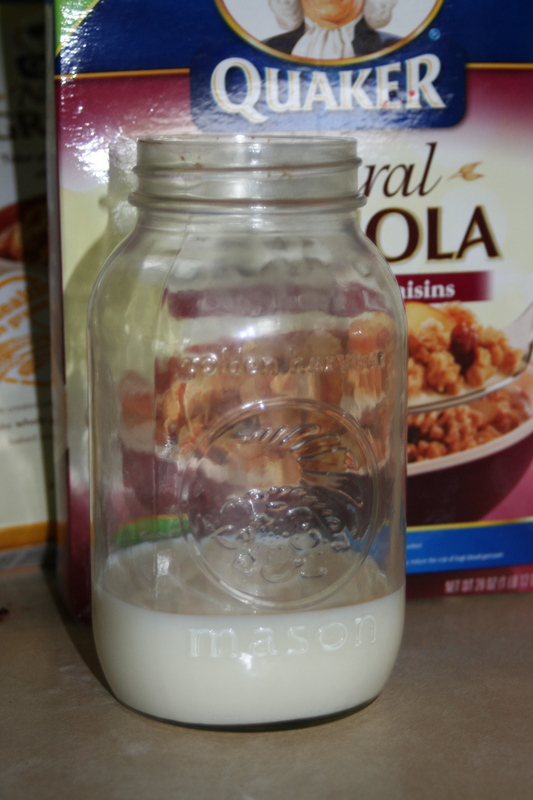 I’m hoping to get to a solid 2 quarts every morning. That’s my goal to hit in the next few weeks. By the time I’m ready to wean Cranberry, maybe I’ll actually be able to milk enough to provide all the milk we use at our house! And when Cranberry’s not getting all that rich cream, maybe some fresh churned butter. Mmmmm. I’ll have to bake some bread. Then try some cheese and maybe some yogurt. Until then…. I’ll keep dreaming of a milking machine! Here’s some new pics of the girls, closer up. I’ve been a cow owner for almost 3 weeks now, and have been milking Ellie for over 1 1/2. I’m SUCH a wimp- I can only get about 2 cups worth of milk before my arms and hands give up on me. In my defense, Ellie’s been “holding up” some on me, but mostly it’s because I haven’t milked a cow since I was a teenager (and didn’t do much then, either!). 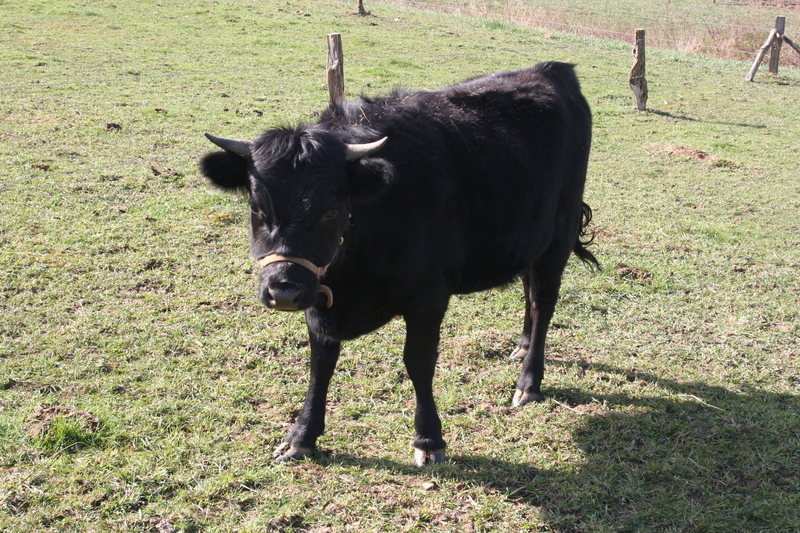 But she is very nice, workable cow. I milk with her tethered in the field (no stanchion built yet) and she usually stays pretty still for me, even when the grain is gone. It by no means is meeting our 5+ gallons a week that we use, but it’s a start. Here’s my first day’s produce. I get about twice that much every day right now. 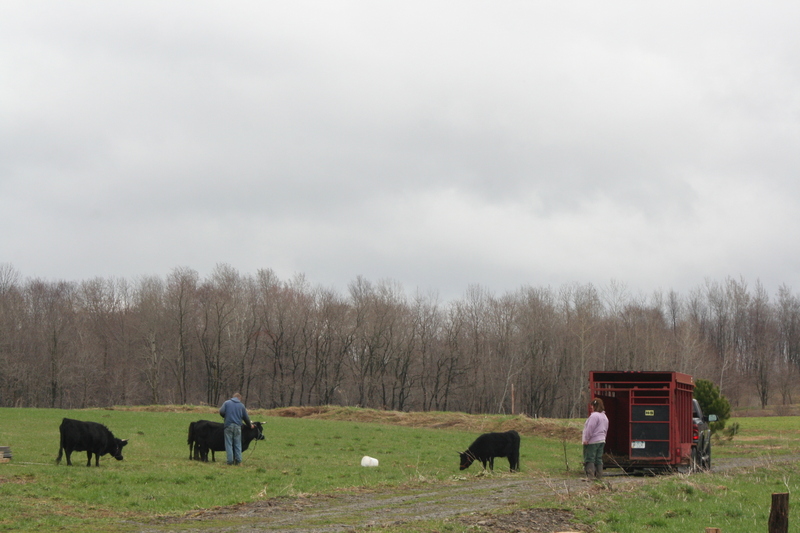 They cows are much happier now that they can be free and together in a pasture rather than on a tether. I think they missed being able to interact with each other and it made them a little crazy. 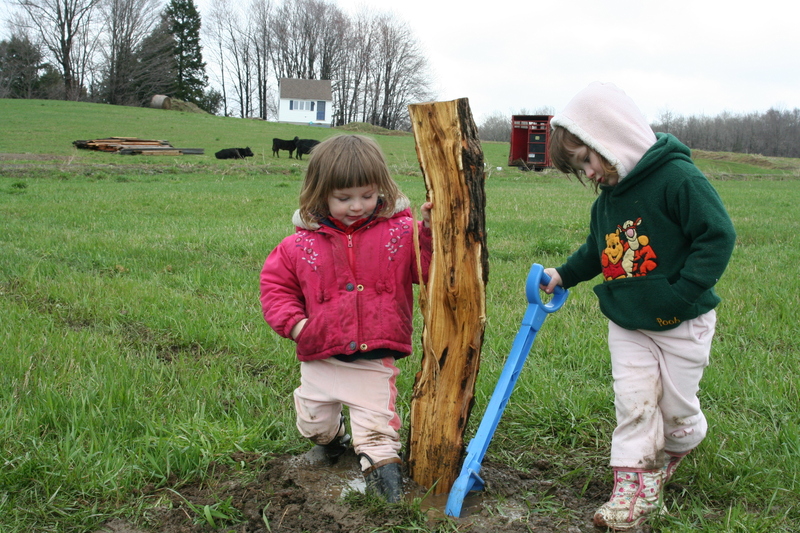 The first section of fence got posts (compliments of John, my parents, my kids, my brothers tractor and my grandpa’s post hole digger) while I picked up my Chantecler chicks the day before Easter. 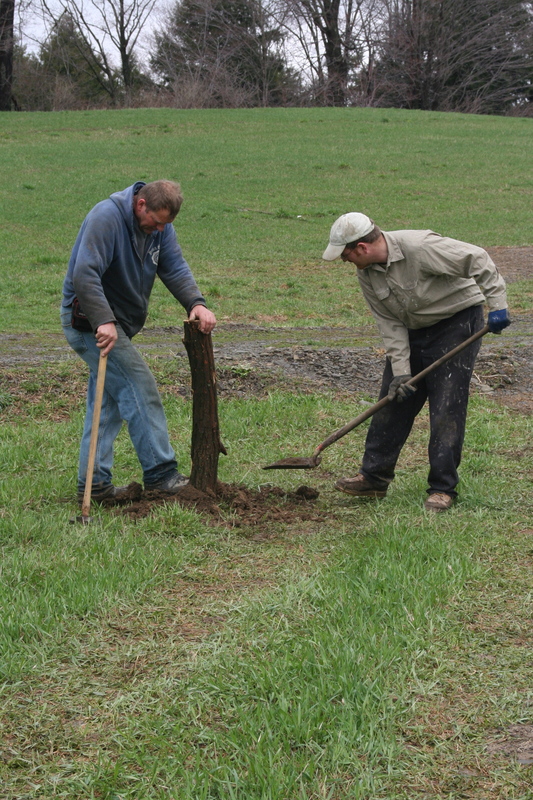 John helped me to string the top wire for that section and he and my dad put in posts for the second section this past weekend. I’ve been plugging along at stringing barbed wire since then. I got a small section done when Norma unclipped her halter on the water bucket one day. 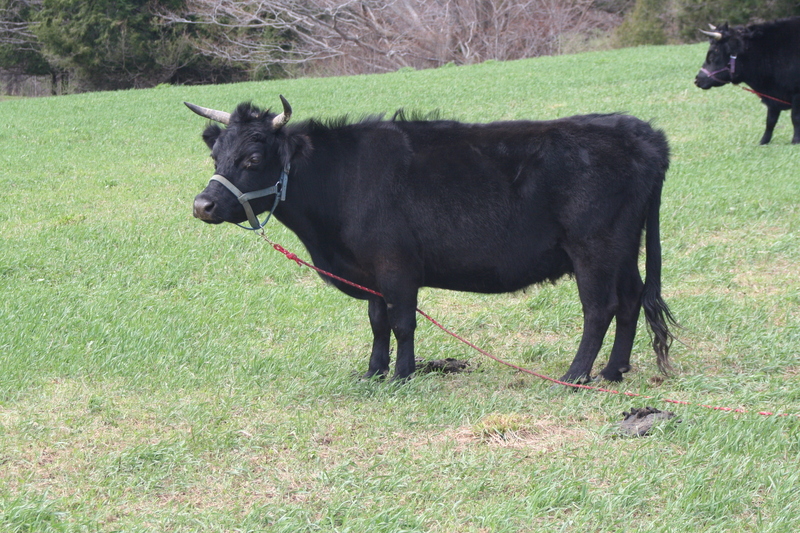 Rather than try to catch her, I just figured I should get the pasture done. The cows have eaten anything edible in the small section already, so I got the rest of the fence done yesterday afternoon so they wouldn’t hate me for starving them. They were so happy to have fresh grass! 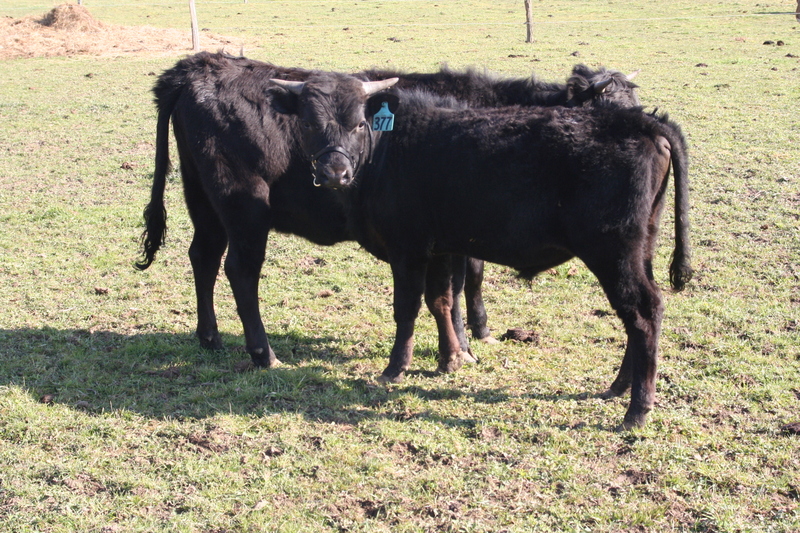 The calf is still tethered so I can keep her separate from mama, or I’d get NO milk. 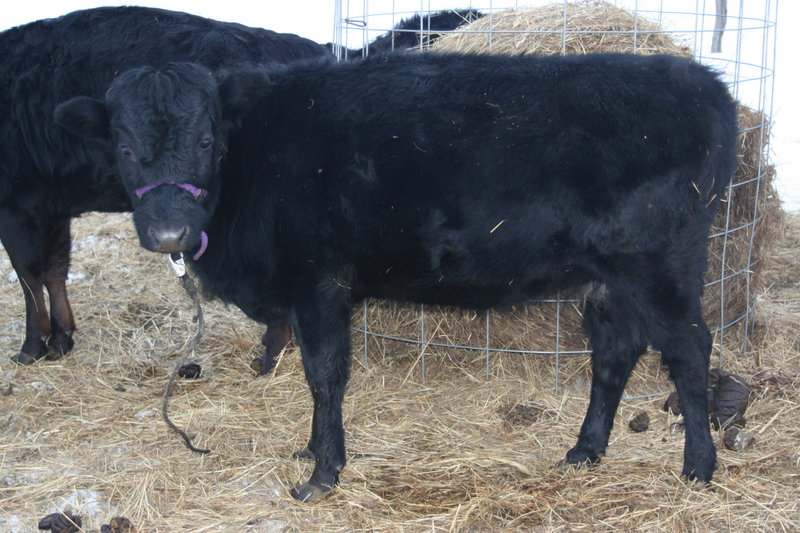 We managed to catch her once to get the halter on, but couldn’t catch her again without that lovely rope clipped to it! Cranberry is gentling down a little, but has a ways to go. Norma and Lannie won’t really let me touch them yet, but at least they’re in the pasture now so I don’t have to try to move them anymore! Here’s a look at our new girls. Just from a distance. I’ll have to work on getting some closer ones. 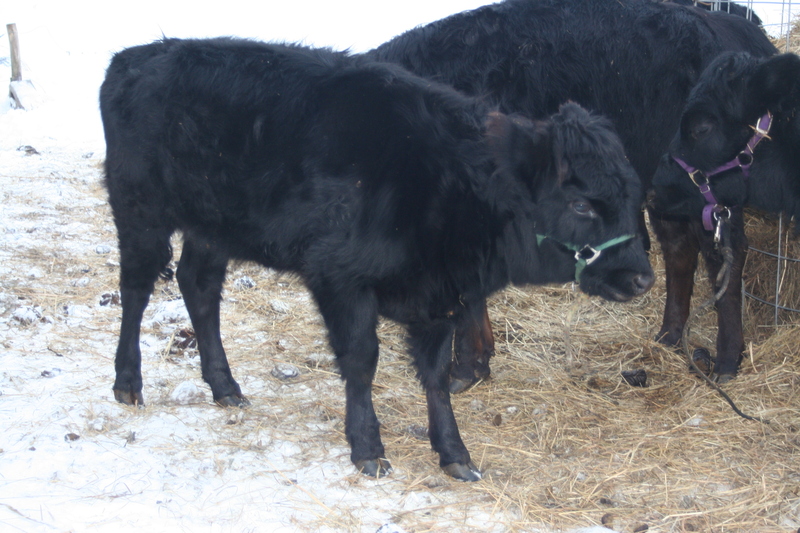 They are Ellie Mae (12- blue halter), her baby Cranberry (born last Thanksgiving day), Eleanor (3- purple halter), and Norma (3- red halter). I need to come up with a new name for Eleanor, since I can’t have 2 Ellie’s and Norah is too close to Norma. So I think I’ll call her either Lannie or Leah. They’re still a bit skittish of me (except for Ellie- she’s truly a sweetie. If you want to come see them and have any chance of touching one, it will be her). 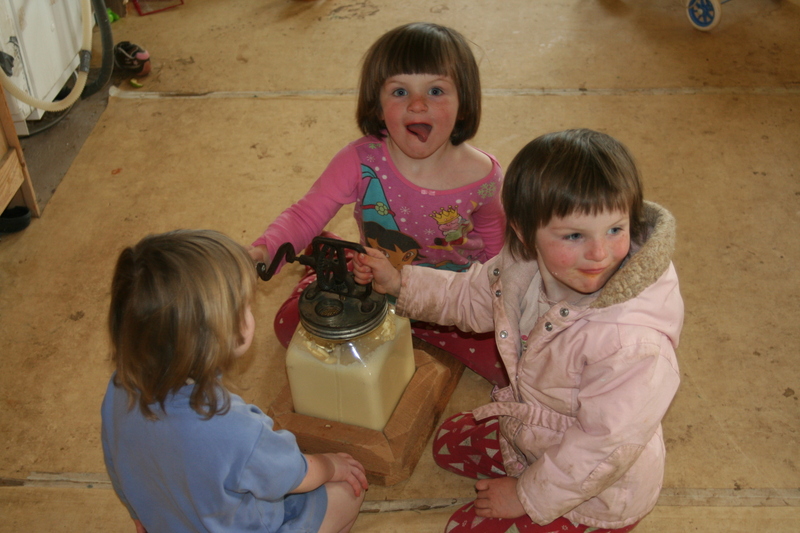 Ellie and Norma have been hand milked (one of the major reasons I decided to purchase!) But Ellie is the only one currently in milk, and none of them are currently bred. Dexters are a natural miniature- there’s no full size version. Eleanor is only 32″ tall, and Ellie can’t be much more. Norma might be 36″? 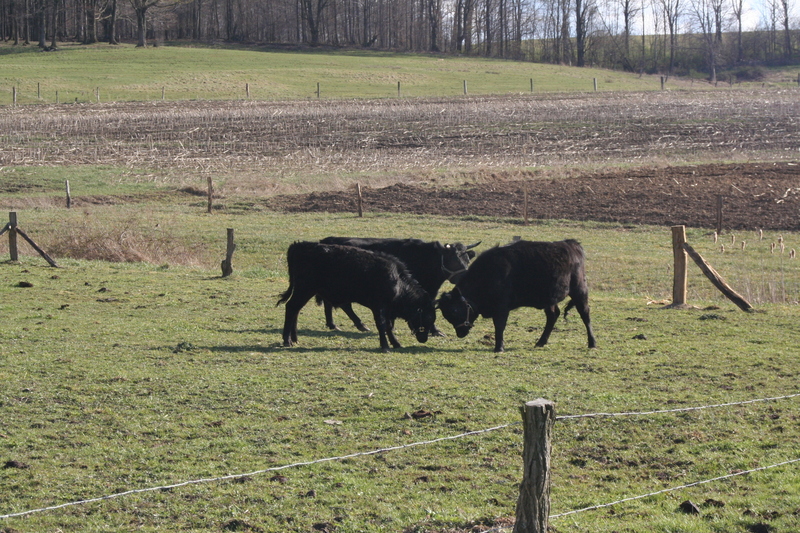 These girls are tethered for now while we get a fence built. It’s just as well, though, as it allows me to interact and get closer to them right now so they’ll get used to me. Cranberry is still a free spirit. 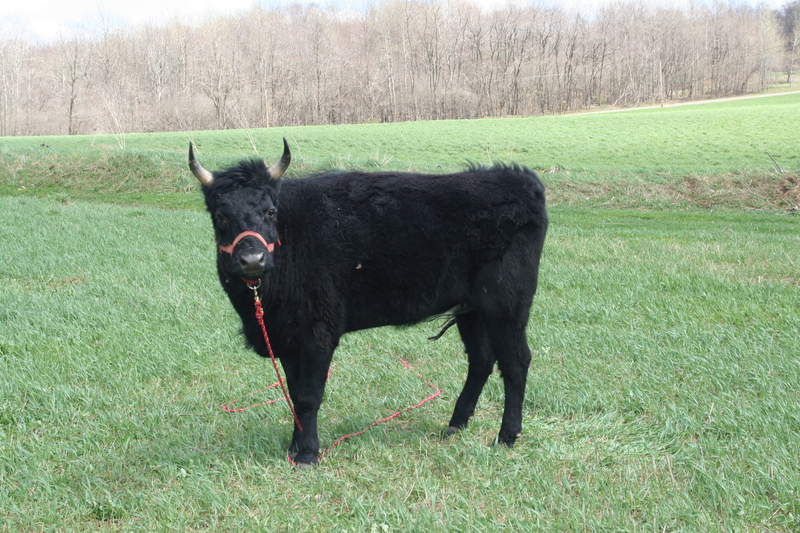 She didn’t come with a halter on, and slipped out of the rope as soon as she got out of the trailer. But since she’s not near the road and sticks close to mama for now, I’m okay with letting her roam. Any votes on what to call Eleanor?